This wallbowl is absolutely huge, measuring 25" in diameter. That's over 2 feet wide! 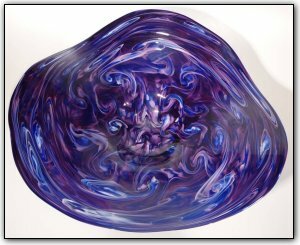 This wallbowl is purple, with some blue and white highlights, and beautiful swirls. Make sure to zoom in and see the intricate, almost lacelike patterns.